After complaining so much in my last email about the 120 degree heat, with no power or water, I wanted to share something more fun. Yesterday (Thursday) was my 2nd to last day of teaching here at RK Valley. We’re leaving tomorrow for Hyderabad. I teach 3 classes, 1 hour each, from 3-6 everyday. 4pm is chai-time (the British weren’t all bad, I suppose), so at 4, someone brings me a cup of chai, a bottle of ice-water and a package of biscuits for my chai. I was walking around the classroom and had my back to the front of the class, when I heard a small crash. I could tell from the crinkling that the biscuits had fallen to the floor – no big deal. The package was closed, and I wasn’t going to eat them anyway. About 10 minutes later, I got to the front of the classroom, and the package was gone. Remember this was only a few days after one of my shoes went missing, and I had to go to the local village to get a new pair. So, I was pretty confused. 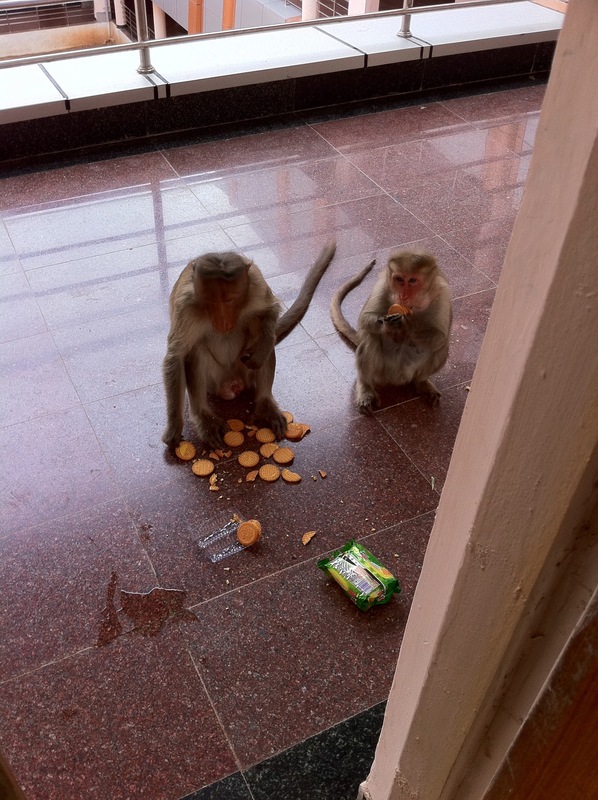 I opened the door to my classroom, and you can see below who came to visit me. It was a family of 4, including a baby (which was pretty scared of me). It’s things like this that make me forget about the scorching heat, and really appreciate where I am and what I get to do. It also makes me miss Pittsburgh – we’ve all been getting a little homesick lately. But, I guarantee, nothing like this would ever happen at CMU :-). Previous PostPrevious Temples, Shopping, and Tombs, oh my!